Imagine the amount of collective brainpower idiotic spammers waste on creative ideas for new ways to get past spam filters. This entry was posted by Jesper Rønn-Jensen	on Thursday, September 6th, 2007 at 10:19 (GMT-1)	and is filed under Blogging, Brainpower, spam. You can follow any responses to this entry through the RSS 2.0 feed. Both comments and pings are currently closed. 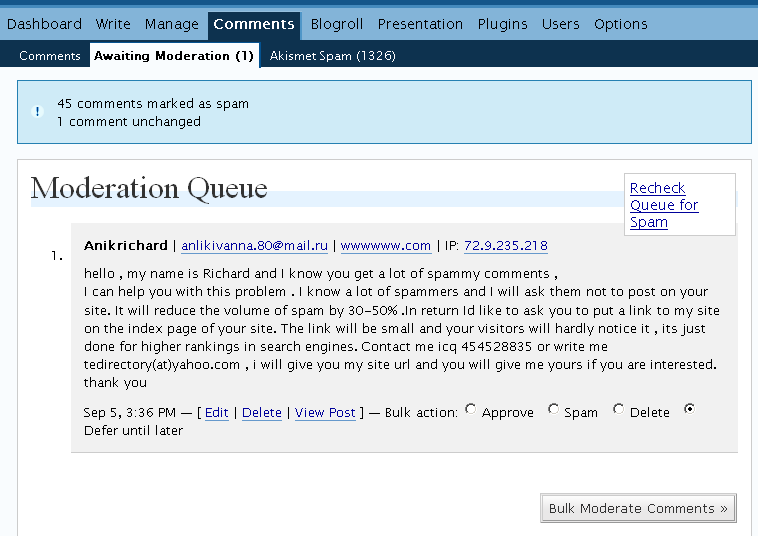 Akismet has caught 331,269 spam for you since you first installed it. Some of the spams you get are quite amazing and funny to be real honest! I agree such a shame that they dont use their minds for better things..